I misplace my iPhone several times a day. This has been going on for years, but lately it has gotten much worse. Each time I lose it, I go into a complete panic attack. I start to imagine my immediate life without it. First, I have to admit to Eliot that I lost my cell. That turns into one of those “You need to get your eyes fixed” moments. The eye doctor told me that in the next few years I should plan on having a cataract operation. They are slowly getting worse. I plan on doing it in the Spring of next year. My cataracts have nothing to do with my ability to find my iPhone. It’s not a sight thing. It’s a mental thing. I am so preoccupied with work that I am capable of leaving my cell in the console of my car, in a ladies restroom by the sink, or on the table at a restaurant. My girlfriend Mindi suggested I get some sort of a holster so my iPhone would have to be returned to the same place after each use. That might be a good solution for the infrequent user, but not for me. I look at my IPhone at least 40 times an hour (a job necessity), so the chances of me putting my iPhone back in the same place after each use is highly unlikely. Most of the time, I place my iPhone in the side pocket of my handbag. One would think it would be secure there. Not true. The contents of my handbag shift around and my iPhone gets lost in the crease of the lining or it falls into the center area. In either case, it takes a minute or two to locate my cell. A full panic attack occurs when I think of all my personal information in the hands of someone else, even though my iPhone is password protected. I tell myself that most of the younger folks know how to decode digital locks. I have been especially miserable thinking about the trouble I would cause myself if I lost my iPhone during the CES convention next month in Vegas. My friend Steve Greenberg suggested the Wallet TrackR as a possible solution. I just got my hands on one a few hours ago, so I don’t know if my troubles are totally gone, but I am cautiously optimistic. The $29 Wallet TrackR is being billed as a leash between my handbag and my mobile phone. This may be just what I need. The Bluetooth-enabled wafer of plastic has already been stored in my handbag. Whenever the TrackR and my iPhone get separated, both the cell and the TrackR start beeping. The companion TrackR app on my cell also takes a GPS snapshot of its location the moment of separation. That’s cool. I also have the option to tap a button within the app to make my handbag “ring” in case I’m looking for it around the house or in the dark. The technology works both ways. 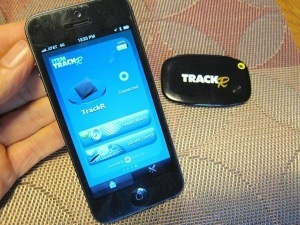 The TrackR works on iPhone 4s and later, iPad retina and Later, iTouch, Samsung Galaxy S3, Galaxy Note 2, Galaxy S4, and Android 4.3 Devices. This entry was posted in digital, senior lifestyle, tech and tagged lost and found, TrackR by loiswhitman. Bookmark the permalink.